after a week of temperatures in the 90s, it was a drastic change to have temperatures ranging from the 40s to the 60s this weekend. we weren't the only ones who were having a hard time adjusting to the quick drop. leko was freezing all weekend long. 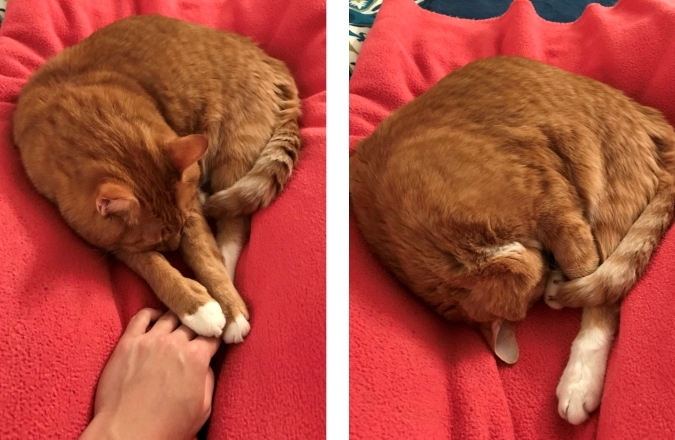 i snapped these pictures on my phone on saturday night when he curled up on my lap on a fleece blanket to stay warm. we woke up this morning to 35 degrees outside! what?! that's almost freezing! right as i was about to get out of bed to start getting ready for work, leko decided to jump back in bed to join me. it was really difficult to get out and not just stay there with him all day. i can't wait to get home tonight to cuddle him and warm him up! what a cutie! I had Lover cuddle up with me all night. He must have been cold and every time I moved he just got closer. We might have to get them another fur coat.